Readers' Favorite announces the review of the Children - Picture Book book "Landon's First Taekwon-Do Lesson" by Victor Teran, currently available at http://www.amazon.com/gp/product/1543966322. ...Victor Teran's picture book for children, titled Landon's First Taekwon-Do Lesson, is an absolute delight to read. I appreciate a children's book that not only provides fun pictures and a cute, pleasant story line but inspires children to ask questions and learn. Within these pages kids will learn about different types of kicks, proper etiquette in a dojo, and why you start with a white belt, which even as an adult I found interesting. 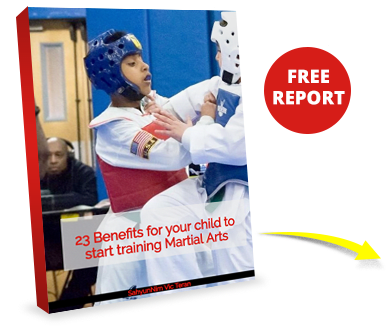 There's a lot of great content in here and Teran ends it with a sweet passage to kids teaching them to respect their teachers, which I think is an especially valuable lesson that can often be overlooked when the excitement of learning Taekwon-Do is in the forefront of their minds. This picture book would be a perfect gift to a child or grandchild who is about to start martial arts lessons. Or you can simply use this as a bedtime story by itself. Landon's First Taekwon-Do Lesson is a home run on all fronts from art to writing and I think you'll find this a worthy addition to any child's library." 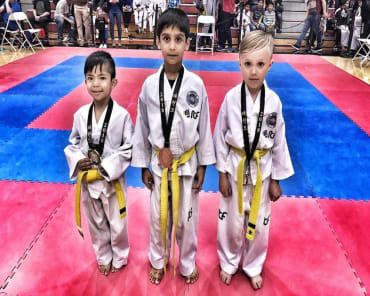 You can learn more about Victor Teran and "Landon's First Taekwon-Do Lesson" at https://readersfavorite.com/book-review/landons-first-taekwon-do-lesson where you can read reviews and the author’s biography, as well as connect with the author directly or through their website and social media pages. Join Us In Hoboken For The Best Martial Arts Training In Town! Master Vic Teran is really an awesome teacher. He is super committed to the class and the discipline i.e. the Taekwondo way of life. More importantly, he is a very nice person! Master Vic Teran is very good with kids and make sures they have a great experience. He really knows how to motivate, inspire and rally the class to their goals and produce results. He really cares about the kids and their lives. They love him and respect him a lot (my son said last week that after # 1 mom and #2 dad, he loves #3 Master Vic in the whole wide world!). I have personally observed all the kids make immense progress with respect to their personalities. The kids, their parents and Master Vic have become a closely knit family and I am very proud to be a part of this family. We recently celebrated 4 birthdays together over the past 2 months and the kids and parents had a lot of fun! Personally, my son started showing a lot of confidence, focus, energy and has started to develop a very healthy attitude in a short span of 3 months. Mr Vic also infuses a lot of cardio exercises and strength training for the kids into the regimen. My 4 year old has increased his stamina and endurance, has grown taller! and his eating habits have also improved greatly. We recently did two 1.5 hour hikes on the weekend which he completed with ease. I have to say that this school is probably the best Taekwondo school in New Jersey! After searching for the perfect place to start my TKD journey in the local area, I was lucky to find the International TKD Academy! Victor is a great teacher/instructor with a great background. Not only am I learning the martial art of ITF TKD, Victor incorporates self-defense and high intensity workouts as well. Couldn't be happier! 100% recommend, you won't regret. My daughter has been attending classes for a short time but enough to realize that the teaching is very good as well as the discipline and respect that is very important, I recommend this school.